Ever since I got myself an iPad Pro for my birthday last month (yes, I bought my own birthday gift ðŸ˜›), Iâ€™ve been drawing with an Apple Pencil in Procreate. I am fascinated by how technology is empowering artists like me to create digital art that imitates physical mediums anytime and anywhere. I was able to create very authentic-looking charcoal drawings with it, but I am not going to replace watercolor painting on physical paper with a digital tablet. After a few drawings and a commission for my friend, I decided to extend this offer to you. It is an incredible privilege to turn my birthday gift into a powerful tool that allows me to serve others. Portrait is always one of my favorite subjects. Creating portraits allows me to learn about a person in a deep yet unobtrusive way. I feel immensely honored when I am hired to do a commission portrait for someone special. Helping someone to craft their message of love into a painting is such a beautiful experience for me. Think about what happens when you visit a famous landmark, monument, or location. You probably see a lot of people taking photos of it. If you search Eiffel Tower on the internet, you will find countless photos taken by different people. Why is that? Because these places and the memories surrounding them are special! When a person receives a piece of artwork of him/herself it helps him/her realize how special he/she is. Itâ€™s a visual way to say, â€œI love you, you are special, and I want to celebrate you.â€� I have never seen anyone who was not happy when they received a drawing or painting of themselves. You can learn more about this commission offer HERE. This is how it works: You will send me a photo. Once I start your drawing I will finish it within two days and deliver the digital file to you. I will then print the drawing out on high-quality fine art paper and ship it to you. So you are not only getting a digital image, you will also receive a real physical piece of art! As a big thank-you for being here and taking interest in my art, I want to offer you something special: a 20% discount for your commission portrait. 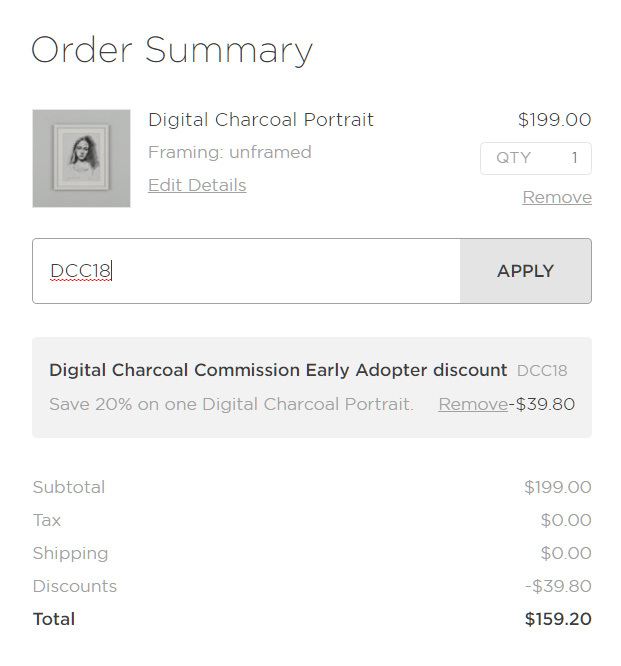 This introductory offer is good for my new digital charcoal portraits and the discount code expires in two weeks. Please use the coupon code DCC18. P.S. If you know you will want a commission piece within the next few months, take advantage of this discount! You can book your commission now and start it later. I will reserve that time for your project.